Another week, another pile of comics! Let's jump right in!! 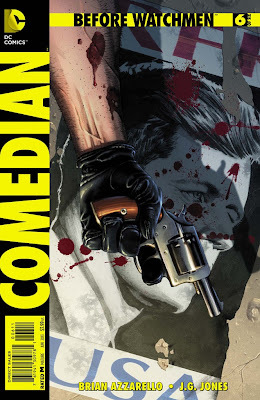 Before Watchmen: Comedian #6 (of 6) - "After what you did here, it's better for everyone--you included--if we sent you home." It's been an interesting and controversial run...all of these Before Watchmen titles were bound to get people disagreeing before even a single page was printed. Having read every issue of every title, I have to say...all the bother wasn't worth it. Take away the hype, and all you really have are a handful of PG-13 super-hero titles, all very beautiful, with some more satisfying than others. They complement the original Watchmen novel without stepping all over it and were for the most part pretty entertaining. Silk Spectre in particular was even insightful! I'm personally happy to have collected this series, but as time goes by I suspect they'll largely be forgotten while their inspiration, the original Watchmen, lives on forever. Still, it's been fun! At the end of the day, that's what I want from my comic books most of all! Superman, The Flash, Batman, Incorporated and more after the JUMP! 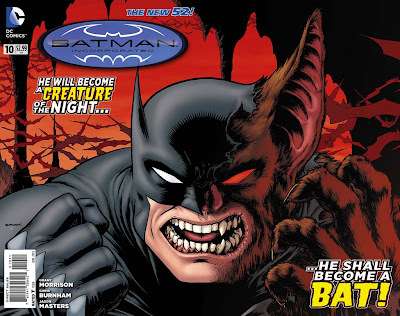 Batman, Incorporated #10 - "They tell me you had your son butchered like an animal. Bravo. 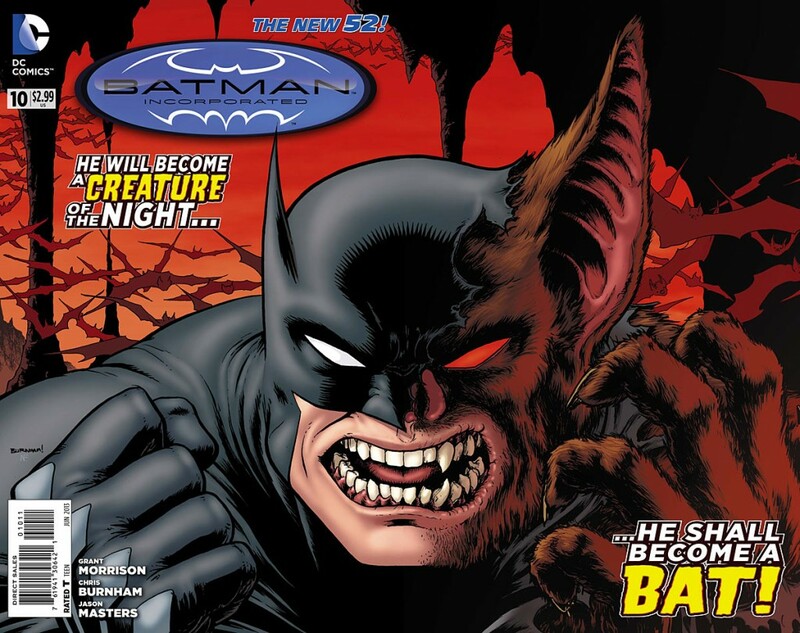 You have become a monster at last..."
All of the pieces are moving into position on both sides, as Batman and Talia Al Ghul prepare to battle for the fate of Gotham City and the World! All of Leviathan's plans are about to come to fruition, taking a terrible toll on Gotham City...unless the members of Batman, Incorporated can somehow find a way to stop the madness! Certainly all of the players are extremely motivated...albeit perhaps our heroes are more driven now by thoughts of revenge for the fallen Robin and Knight than by any higher moral concepts....certainly the steps that Batman takes this issue are unprecedented! This is war on the most personal level for Bruce and his whole fractured family! With only 3 issues left to wrap everything up, I can't wait to see what happens next! 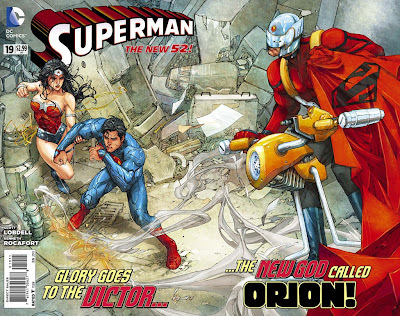 Superman #19 - "You've got another forty-seven seconds to end this peacefully. Anything that happens after that is on you. Eight. Nine...."
Busy day for Superman, as he has to stop an alien invasion by a race of alien gladiators known as the Sunturians, mainly due to them being composed of red sun particles that weaken the Man of Steel just by their proximity! Not only this, but he must also, as his alter-ego Clark Kent of course, attend a housewarming party for Lois Lane and her now live-in boyfriend, Jon Carrol. Clark would rather fight more aliens! Luckily Supes has reinforcements in the form of his date, Diana Prince aka Wonder Woman! Unfortunately, he's running late, and Princess Di gets to the party first! It just gives her a chance to meet the people in Clark's life without his interference. Of course...all of these people are acting subtly "strange"! It may have something to do with the same psionic force that was forcing people to throw themselves off of a building last issue. It almost certainly has something to do with the apparently comatose and brain-dead Hector Hammond, he of the humongous head! Oh and as the cover indicates, Orion shows up too! But why?? Oh by the way, let me mention once again how much I LOVE Ken Rocafort's art. His Lois and Diana, in particular. Amazing! 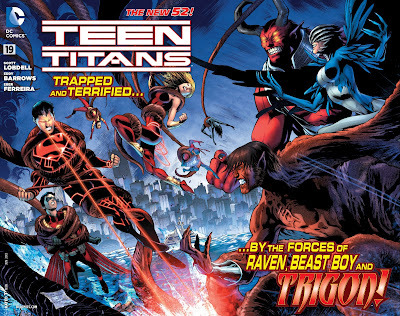 Teen Titans #19 - "Can't we just talk this through like reasonable costumed teenage danger-junkies?!" The argument quickly gets put to one side, however, when hell LITERALLY overflows into Times Square! Lord Trigon arrives on a three-headed, eighteen-eyed hell-horse (only four legs, though) to draw our heroes into battle! He also draws his daughter Raven, and her new-found acquaintance, Beast Boy! That's got to cause a mess! Oh the artwork is quite nice! I was a fan of Eddy Barrows on Nightwing, and it's nice to see his take on these characters, too. I'm not sure why the artists traded spots (previous Titans artist Brett Booth is now drawing Nightwing) but a fresh perspective on both books could really bring them alive! The Flash #19 - "My name is Barry Allen, and today I'm not the Fastest Man Alive..."
Last issue, the Flash had broken into jail to try and stop the Trickster from escaping and making his case worse. 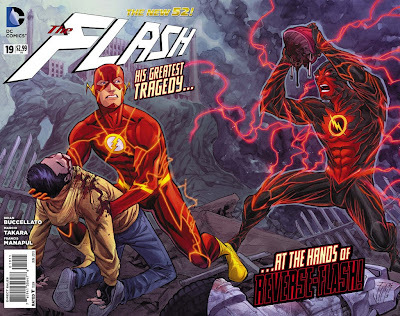 Trickster has been falsely accused of murder and Flash wants to prove he didn't do it. Sadly, once Barry's in the jail, his powers mysteriously vanish!! This is quite problematic, as you may well imagine! Apparently Barry's speed force powers got briefly "borrowed" by the characters in Dial H for Heroes. I don't read that book, so I don't really know why or how. At least I DO know that this power-down is only temporary! Barry, however, doesn't know if or when his powers will EVER return, and thus is forced to improvise just to survive! AND...that's it for me this week! You may have noticed that these articles are getting shorter. I've decided, as my schedule has become extremely busy now that Spring is here, that I can really only inlcude my top 5 comics each week...this may change from week to week depending on which title I've enjoyed the most! However, if anyone has a request for a specific title that I used to cover and which has now vanished, let me know! Like any good writer, I'll do most anything for a reader! PS: Aquaman was delayed a week, but he will be included when the book comes out...speaking of which what's on the agenda for New Comic Book Day tomorrow?? Aside from the aforementioned champion of the seven seas, we also get Action Comics, Green Arrow, Earth-2 and more!! Man, I love new comic book day! As always, I ramble on over at Stryder's Dementia, too. This week is all about how sick and tired I am of being sick and tired. Take a look! Have a great week all! I'm off to play a little more Injustice! Peace!